When Magico, LLC announced the imminent introduction of the S3 Mk II loudspeaker late last year, it wasn’t exactly shocking news. After all, two other members of Magico’s S Series, the S1 and the S5 models, had been updated to Mk II status and the top-of-the-series S7 already incorporated the diamond-coated beryllium tweeter and nanographene midrange cone that represent Magico’s latest thinking on driver design. So, the important changes seen with the S3 Mk II—compared to the original S3, which first shipped in early 2014—parallel those found in the new S1 Mk II, reviewed in Issue 270. In addition to the 1" MDD7 dome tweeter, 6" M390G XG graphene midrange, and a pair of new 9" M905G graphene bass drivers, the top and bottom pieces of the sealed box enclosure have been revised. Although the size and shape of the speakers hasn’t changed much—on end, the profile is still that of a rounded trapezoid, wider in front than behind—the cabinet is now more effectively braced, with bolts extending through the ½" aluminum shell to connect to stabilizing internal braces. As with the original S3, the main component of the Mk II’s monocoque enclosure is a single piece of aircraft-grade aluminum, produced at a factory in Ohio that makes the largest such extrusions in the world. (The metal part for both original and Mk II S3 is 16" in diameter; the Ohio plant can now manufacture an 18" extrusion.) The midrange driver has its own internal compartment and a new German-sourced damping material, known at Magico as “angel hair,” is employed in the sub-enclosure. There is, as well, a foam/vinyl adhesive that coats the inner surface of the metal shell, plus some strategically deployed “stuffing,” also new. The crossover has been reconfigured to elevate the speaker’s impedance and make the S3 Mk II easier to drive than its predecessor. 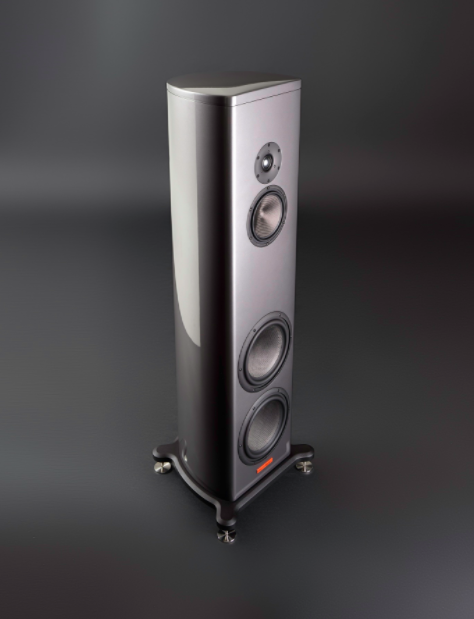 Magico also provides specific advice regarding positioning its loudspeakers. It’s suggested that the S3s be initially placed about 20 inches from the front wall and then moved out toward the listener in six- to eight-inch increments until the speakers’ bass performance is optimized. Equally detailed instructions follow for siting the S3s vis-à-vis the sidewalls, and for toe-in. In my 15' x 15' room (a hallway off one sidewall obviates serious standing wave issues) the S3s wound up 24" from the wall behind them and about 8' apart, center-to-center. The front of each speaker was approximately 9' from my ears; toe-in was such that imaginary lines extended from the front baffles intersected a foot behind my head. Once positioned, the supplied spikes were attached to the four outrigger extensions of the enclosure’s bottom piece, and the loudspeakers were carefully leveled. In my case, the spikes pierced the carpet and underlying soundproofing material to make contact with the concrete slab beneath. Magico does provide metal discs to receive the points of the spikes if the S3 Mk IIs are situated on a hard surface that you don’t want to damage. There’s also the option of replacing the spikes with Magico’s pricey QPods that are machined from aluminum, steel, and copper into a structure said to have exceptional vibration-dissipating properties. The speaker’s metal grilles are held in place by an invisible magnet system—the User’s Guide describes them as “optional” so it’s safe to assume that Magico feels that you should do your serious listening without the grilles on. The S3 Mk IIs were assessed using much of the same associated equipment I used to put the S1 Mk IIs through their paces last year. Mostly, either a pair of David Berning Quadrature Z amplifiers (200Wpc) or two Pass XA 60.8 monoblocks provided amplification. Continuing upstream, the control center was my usual Anthem D2v. Only digital sources were used, including an Oppo 93 disc player (functioning as a transport) and the Baetis Reference 2 music computer, which played files stored on a Synology NAS. Both sent PCM output to the DACs in the Anthem; non-converted DSD files were also played through a T+A DAC 8 DSD. I also had on hand an Aurender A10 (review in progress) that’s equipped to handle MQA-encoded files, as streamed from Tidal. The bulk of the interconnects and speaker cables were Transparent, save for a high-performing yet quite reasonably-priced Revelation AES/EBU wire employed between Baetis and Anthem. As usual, I ran DSP room correction with the Anthem’s ARC software and, after inspecting the room response curves, used equalization up to 2kHz. Considering the usual sonic metrics, the Magico S3 Mk IIs performed exceptionally well. (See sidebar for Alon Wolf’s perspective on how S Series loudspeakers contrast with the company’s more complex Q Series models.) High-frequency musical information was open, airy, and non-fatiguing in the fashion of a good electrostatic, but with better dispersion. Upper register divisi violins at the beginning of the Act 1 Prelude to Wagner’s Lohengrin had the kind of texture one appreciates in life—there was a clear sense of many unique instruments being played, rather than a synthesizer-like homogeneity. With a recording of a Balinese gamelan ensemble of flutes, gongs, and a range of metallophones, the Magicos reproduced the singular overtone structure of these instruments very characteristically. Tonal neutrality and accuracy were apparent in the critical midband. It wasn’t difficult to distinguish a Stradivarius from a Guarneri del Gesù violin, Renée Fleming in 1996 from Renée Fleming in 2016, or a bass clarinet played at the very top of its tessitura from a regular B-flat clarinet operating in the middle of its range. Top-to-bottom tonal balance was preserved through the Magicos—darker recordings vs. more brightly lit ones maintained their yin vs. yang qualities. Bass was immensely satisfying in its impact, speed, and pitch definition. With organ recordings possessing prodigious low-frequency energy—Jean Guillou’s two-CD Franck set for Dorian, for instance—the S3 Mk IIs remained articulate when the deepest pedal stops were called into service, an especially impressive feat given that the recording has a great deal of room sound, having been recorded in a large Parisian cathedral. Lesser speakers, even those that claim low-end extension into the mid-20s (Hz), can render this challenging material as an undifferentiated rumble. Electric bass had plenty of punch and percussive slam, but only when it was present on the original tape—these loudspeakers do not editorialize. Certainly, you won’t regret what a high-powered amplifier will do for bass heft and mass but the 60Wpc Passes didn’t find the S3s to be an especially difficult load, in terms of generating orchestral weight or rock ‘n’ roll gutsiness. Even in my smallish room, by the way, the S3 Mk IIs did very well with a subwoofer (Magico’s S Sub, in this case). Alon Wolf feels strongly that subwoofers are meant to be used with full-range main speakers—he maintains that attempts to integrate one with a smaller loudspeaker will inevitably “pollute” that speaker’s output. Though I did experiment with rolling off the S3s in the 50–60Hz range and letting the S Sub operate up to 60Hz or so, the best results, by far, were achieved when the S3s ran full-range and a high-pass filter for the sub was applied at 40Hz. Authoritative power was added to the bottom octave and spatial cues about the recording space were better demonstrated.